The Swiss chose to rest Roger Federer in Saturday’s doubles, instead sending out Stanislas Wawrinka and Marco Chiudinelli, who nearly pulled off the sweep. Although they lost in five sets, captain Severin Luthi was confident heading into Sunday’s reverse singles. The Swiss maestro was indeed fresh, cruising through the first two sets against Italian #1, Fabio Fognini. Switzerland had previously reached the Davis Cup semifinal stage in 2003, losing a tough encounter to Australia in Melbourne. Fognini settled in as the match headed for a third set tiebreak, but Federer’s forehand return winner at 4-all proved pivotal. The Swiss fired an ace and after the following rally ended with Fognini’s forehand in the net, it was over. Switzerland’s bench cleared and the sold out Palexpo arena went into a frenzy. Federer’s win clinched the semifinal tie against Italy, 3-1. 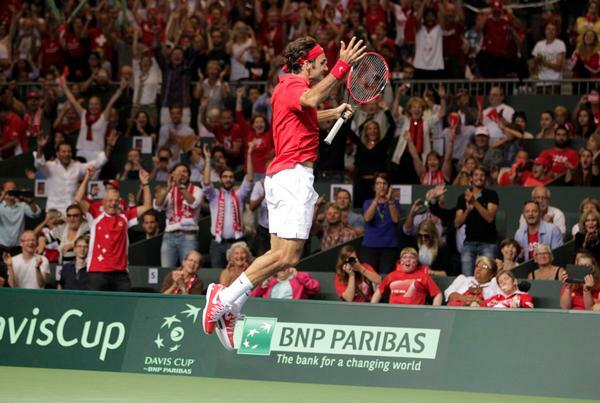 The Swiss are into their first Davis Cup final since 1992, and will head to France November 21-23.